In 2008 was the first time I guided on a regular basis, and really enjoyed it. Almost all my guide business were people from my fishing schools, so it was extra fun to show them how techniques that were taught in the classes worked on the water. I regret not being able to take out everyone that wanted to book me, but I just didn’t have enough dates available. This year I will take more bookings in May and extend a little more into July. I expect an even better year because I discovered several new patterns that are deadly in May on both Lake Geneva and Lake Delavan. Guiding on a regular basis made me a better fisherman because I could see the changes in fish location and activity levels on a day to day basis. I wasn’t just going fishing under more favorable conditions. Drop-shotting is by far the best presentation on Lake Geneva using 4 ¾ inch Yum Houdini worms, a 1/4th ounce drop-shot sinker and a size 1 Gamagatsu drop-shot hook. On Delavan, using 5-inch soft plastic Yum Dinger rigged wacky worm style on a 1/0 Gamagatsu shiner hook caught the most fish, but other presentations were also effective. Last years clients and those that were on the waiting list will get first crack on dates. Then will come those in this spring’s classes. After that the general public, but all the days should be booked by then. Prices will be the same as last year $325 for one person; $375 for two for a full day. The day usually starts at 6:30 am and lasts until at least 2:30 pm., unless other arrangements are made. This year I might try some half day trips. These would be from 3:30-4 pm to 7:30-8 pm. I’d only do this a few times a week so I don’t get too tired. The cost on these would be $225 for one or $275 for two. We meet at Linn pier on Geneva and at the main park on route 50 for Delavan. Last year I often spent several hours in the evening re-spooling lines; sometimes as many as three reels with expensive super lines. It would be a great help if you can bring a spinning reel spooled with 10-pound braided line. I would recommend SpiderWire Stealth. Fire Line and Power Pro are other good lines. I will have plenty of fluorocarbon line to make leaders and I will be happy to show you how to tie them. I will have extra rods if needed. The ideal rod for drop-shotting is a 6 ½ to 7 foot medium-light rod which is generally rated for 4 to 10 or 6 to 12-pound test. I’m working on getting a great deal on perfect 7-footers that will be available in the classes. Last Spring was again great while guiding on Delavan and Geneva. I got a little later start on Delavan than normal because I was in Louisiana in early May and didn’t get out to Delavan until May 10th. As usual, early season success is greatly affected by weather conditions. 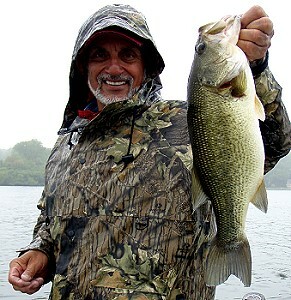 If the weather is stable or warming, fishing is usually best. 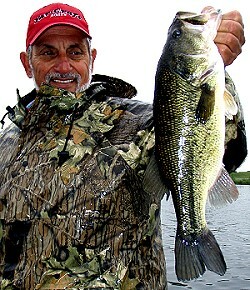 If there is a drop in water temperature followed by a cold front, fishing its usually tougher. If conditions aren’t favorable, I will call the night before a guide trip and suggest we cancel and rebook another day. I usually do that 3-4 times a year. I don’t want to take money unless we have a good chance to catch fish. 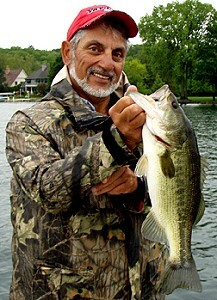 Years ago if I boated 20 bass in a day on Geneva I would be very happy. Not anymore! On Delavan we averaged 36 bass a trip, and on Geneva we averaged 48 bass a trip. We had slightly higher numbers on Geneva last year, but this year the fish averaged larger. I had several days that were particularly enjoyable to me. My favorite day was on May 31st. on Geneva with John McDonald and his 14-year old son Kade. We were having a great day and already boated 67 bass. We finished up on our last spot and I told everyone to reel in. Seconds later I heard Kade screaming “get the net!” As he was bringing in a small rock bass a musky grabbed it at boat side. The kid played it like an expert and a few minutes later I reached out with the net I scooped up a beautiful 38-incher. The excitement this fish created for Kade was fantastic. After he hugged it and kissed it, the fish was released to fight again. Two days later I caught a 37-incher that hit a small bluegill. Another great day was with “the record breakers”, the two Shackleton brothers. In 2016 we boated 103 bass on Geneva which is my all-time record. This year we boated 80 which was this year’s record. We also had the record “worst day” of the year on Delavan when we boated 15 bass, 10 pike and a walleye. It’s all about the weather on any given day. My slowest day on Geneva was 27 bass. My best day on Delavan was with Reid Urban and we caught 60 very nice-sized bass. What was special besides the numbers, was the lake was almost empty of anglers because of a lot of slime in the shallows that made getting to the bass very tough. On this day most of the slime disappeared overnight and left the shallows very fishable and the bass population in the area we fished very exposed. Reid is one of the best anglers I guide every year and the one that showed me “the sneaky rig” years ago. A note from the webmaster: I was lucky enough to spend a day on the water with Spence, first on Lake Delevan and then on Lake Geneva, this past season. The photos on this page are just a sampling of the many largemouth bass, smallmouth bass and northern pike that we caught on that one day adventure. All I can say is that if you can book a trip with him – don’t even hesitate. It was one of the most enjoyable days of fishing that I had all season and I also picked up a few new “tricks” that put more fish in the boat the rest of the year. Thanks again Spence for the GREAT memories!